I expect 10 systems to be type approved by end of 2017. Weighs on Shipowners its ? 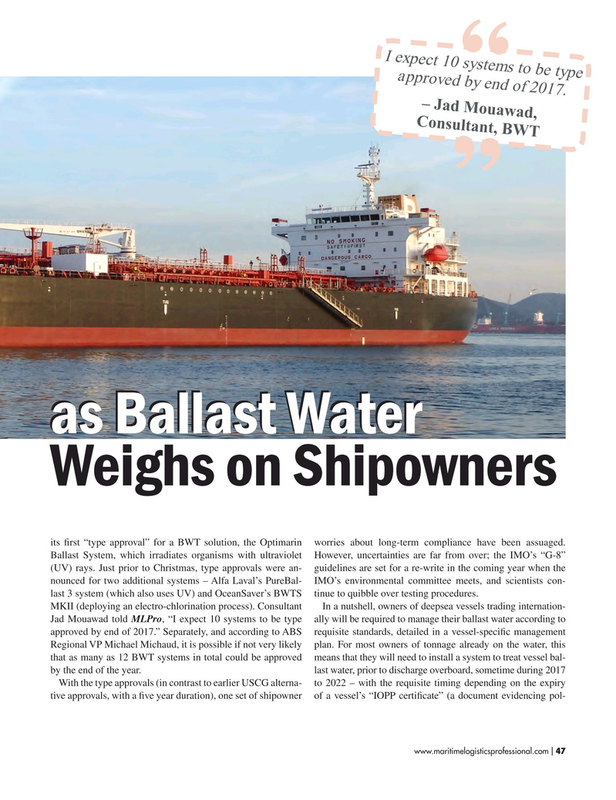 rst “type approval” for a BWT solution, the Optimarin worries about long-term compliance have been assuaged. Ballast System, which irradiates organisms with ultraviolet However, uncertainties are far from over; the IMO’s “G-8” (UV) rays. Just prior to Christmas, type approvals were an- guidelines are set for a re-write in the coming year when the nounced for two additional systems – Alfa Laval’s PureBal- IMO’s environmental committee meets, and scientists con- last 3 system (which also uses UV) and OceanSaver’s BWTS tinue to quibble over testing procedures.